The study of science can be a challenging, yet rewarding, endeavor for students who choose to pursue such a path. Studying physics at Moravian College is particularly rewarding, thanks to a strong foundational preparation, meaningful community outreach, student-centered esprit de corps, and plenty of opportunities for you to engage in your own research. What makes a successful physicist? All of our courses have a strong problem-solving component, in which you'll learn to struggle with and solve complex problems using many methods. You'll take a number of co-requisite mathematics courses, as well as courses in mathematical physics. In addition, being a mathematically- oriented science, students experience many methods that can be applied to experimental phenomena. Many of our courses have associated labs where you'll apply ideas learned in class to experimental studies. As a liberal arts institution, Moravian College gives you a broad background in many areas, not just physics and mathematics. Within the discipline of physics, we also offer a large number of courses—students can take up to 14 courses within the physics program, in addition to others within the Earth Science program. 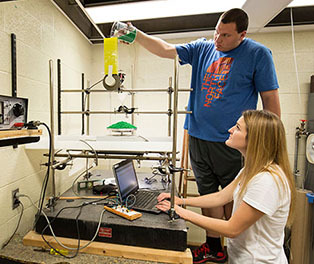 Research programs such as SOAR and the Honors program present opportunities for independent research while working closely with a faculty member. And while laboratories may involve group collaboration, you'll be responsible for your own laboratory reports, analysis, and homework. If physics were easy, everyone would do it. Because of the workload required of you—and the rewards of accomplishment—you'll develop the attitude and fortitude of a strong work ethic that will serve you in other endeavors. The experimental and research opportunities offered by our program gives you a chance to formulate unique solutions to many problems. Often, these solutions require innovative thinking and applications of methods to different situations. All majors incorporate a writing intensive course that engenders good writing skills; for physics the course is PHYS222 Modern Physics. In addition, you'll produce posters and present your results in class, incorporating a speaking component to your studies. Our physics majors often present their research at regional and national conferences such as NCUR and AAPT meetings. The experiments you'll perform offer many open ended avenues for exploration and encourage a spirit of curiosity. Ljuboslav Boskic '17 AND Rebecca Hamel '17 tried their hand at designing improved dropping mechanisms and relay circuits for an old apparatus.